Professionally drawn cross guarantee to benefit a lender or other counter party dealing with to one or more members of a group of companies (or associated individuals). Each member of the group guarantees one or more loans or contracts made by one or more of the others. Could be at start of a new original contract or supplemental to an existing one. Option for changes to terms of main agreement. Strong protection for lender / counter party. Applicable to any situation. This professionally drawn agreement provides for one or more companies to guarantee the obligations of one or more other members of the group of companies, as set out in a named, identifiable contract. It gives strong protection for the lender. This arrangement could be made at start of a new original contract or supplemental to an existing one. Such an agreement is most often used to guarantee repayment of a debt, but a cross guarantee could be used to cover any contractual obligation. The document also provides options for changes to the terms of the main agreement. Applicable to any situation, including where the group companies are abroad. 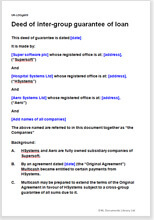 This deed of inter-company cross guarantee may be signed as a deed, or as a simple agreement under hand, as the notes explain. There is no modern statute law relating to guarantees. This document is based on contract common law. If you are looking for a situation where the guarantor is not a member of the same group of companies, or where you want to guarantee performance rather than repayment, look at Deed of inter-company cross guarantee.